Need an inexpensive way to throw a party or entertain your guests? 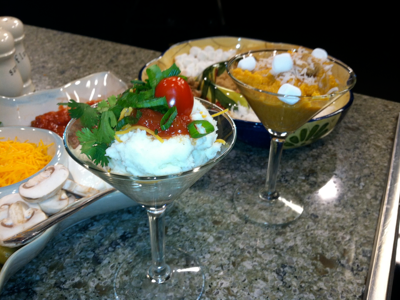 Serve delicious, comfort food mashed potatoes and mashed sweet potatoes in martini glasses, and place toppings out for your guests to create their own "potato" martini. My friends Jessica and Todd had a potato martini bar at their wedding ... now that's love. In a medium sized pot, add potatoes, and cover with water and add a dash of salt. Bring to a boil, and once potatoes are fork tender, drain. Return potatoes to pan (but not the heat) and let the steam leave your pan. (This shows any remaining water still on potatoes). Add Greek yogurt (or sour cream), butter, milk, salt and pepper and mix with a hand mixer. You may have to adjust the amount of sour cream, butter and milk, but you will be able to tell as you mix, if your consistency is what you desire. Peel sweet potatoes, then cut into cubes. Boil and once potatoes are fork tender, drain. Pour into a mixing bowl, and mix all ingredients together, beating to combine until potatoes are smooth.